Dive in and see if this game is for you! 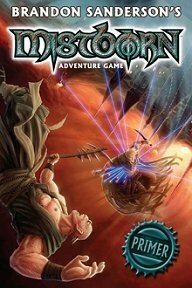 Publisher's blurb: "Based on the best-selling novels by Brandon Sanderson and powered by an all new story-driven rules system, the Mistborn Adventure Game lets you explore, command, or liberate the oppressed world of Scadrial, battle the Lord Ruler's Inquisitors, and master the primal forces of Allomancy, Feruchemy, and Hemalurgy. It features new official fiction from Brandon Sanderson and loads of never-before-seen material, making it the ultimate resource for fans of the novels and those who want to experience the Final Empire firsthand. The very core of the Mistborn Adventure Game rules - on just two 6 x 9 pages!